Home to a large number of major international airlines, Cleveland Hopkins Airport (CLE) is one of the most important air facilities in Ohio and is within easy reach of the city center. Containing modern facilities and good ground transportation options, Hopkins Airport also offers a wide selection of car rental companies, such as Alamo, Dollar, Hertz and Thrifty. Nearby points of reference include the Rocky River Reservation, the Lake Abram Metropolitan Reservation and the Big Met Golf Course, while the suburbs of Berea, Brook Park, Fairview Park, Middleburg Heights and North Olmsted are also close by. The airport can be found just 10 miles / 16 km to the southwest of central Cleveland and caters for some one million passengers every single month, which equates to an average of approximately 250,000 passengers each week. There is just one terminal building, containing four different concourse areas. 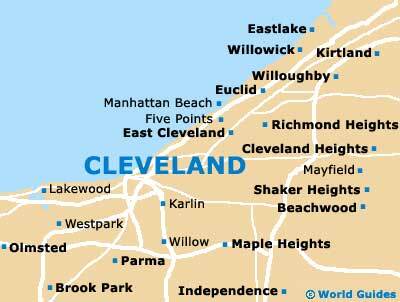 Cleveland Airport is well integrated into the area's network of roads and is within easy reach of the city center. This air facility is located nearby the Berea Freeway, which leads to Interstate I-71 and Interstate I-480, and then the downtown district. Driving time to and from Hopkins Airport is approximately 25 minutes, when traffic levels are reasonable. Nearby places of interest include Akron, Canton, Mansfield, Massillon, Strongsville and Youngstown, while further afield you may like to drive all the way to Columbus or Pittsburgh. 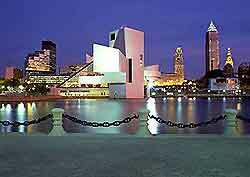 Book your Cleveland Car Rental here. The city's popular underground train network is known as the 'Red Line'. Providing one of the most popular connections between the airport and the centrally located Tower City Station, this journey lasts around 30 minutes, with a number of stops en route. Local trains are operated by the Greater Cleveland Regional Transit Authority (RTA), with departures roughly every 15 minutes throughout the day. Cleveland Airport is home to a number of public buses, traveling to and from the terminal when the Red Line Trains are not running. The bus service is an inexpensive travel option and route RTA66S heads into the heart of the city, while Greyhound buses are also on hand and run between the Greyhound Station on Chester Avenue. Shared-shuttle buses are another popular method of ground transportation, being operated by Airport Oberlin Shuttles and the Hopkins Transportation Services. Shuttles run between 12:00 and 17:00, with evening pickups being possible with prior arrangement. An increasing number of the principal central hotels are now providing a door-to-door shuttle bus service for their guests, which is free of charge. Traveling from Cleveland Hopkins Airport directly to the entrance of the relevant hotel, these shuttle buses may need to be arranged in advance with the hotel. Taxis are in plentiful supply at Cleveland's international airport, with the main taxi rank being situated outside of the luggage reclaim level and comprising some 75 bright-white vehicles. Operated by Ace Taxis (tel: +1 216 361 4700), Americab (tel: +1 216 881 1111) and the Yellow Taxi Cab Company (tel: +1 216 623 1500), taxis are one of the most convenient ground transport options and are reasonably priced. Fixed rates are charged for determined distances, although metered rates will apply after hours. Of note, all taxis now happily accept payment by credit card.